* 1967 – The Senador Pompeu team disputed the intercity soccer championship and was going through a phase of defeats. They then hired some players of the Tiradentes team to help strengthen the Pompeu Senador team. Among them camea few officers , one of whichwas Corporal Mark, who was a black belt in Judo / Jiu -Jitsu ( the two arts were less differentiation at the time and the names interchangeable) . Noting the potential and the deep interest in grappling by the young Dárcio, the Corporal decided to start training him every day from 5 am to 6 am , in the sands of Rio Banabuiú . This was the time the Corporal had free before the start of their soccer practices. This super intensive training began at sunrise and the dojo was the beautiful sands along the reef. This lasted for a few months until the Senador Pompeau team was disqualified from the competition and the Cape Marcos had to return to Fortaleza. * In these open challenges, after the demonstrations , Professor Sá wondered if any of those present doubted the efficiency of such defenses. If the answer is affirmative , the challengers came onstage to attack the practitioner as they pleased , often with weapons ( sticks , knives , chairs ) and the demonstrator had to be really ready for the unexpected. Then Professor Dárcio Lira came to open gyms for a few times (even in the period when he was living for about 10 years in Porto Velho - RO ) , but for lack of time due to his arduous working hours and irregular scale he declined to keep them formally . By 1999, Dárcio was already being recognized as a true legitimate Professor for the originality of his ideas and seriousness of his conduct. He was being praised, not only by Jiu-Jitsu teachers from various states of the country, but also by teachers of other systems of Martial Arts (around the globe). His work in the martial art and the growth of his system was not unnoticed in his own state, and he received from Grand Master José Gomes (Brother of the late Ivan Gomes) recognition and graduation to Master 6th Dan. In 2003 he was promoted to 7th degree by FIDAM (Federación Internacional de Artes Marciales), in an international recognition of his important work done in favor of disclosure and rescue of the social respect to Jiu-Jitsu art in Brazil. * The Master Dárcio has never given importance to his own graduation and sometimes even tried to avoid them, because in the past when he started training, his only goal was learning the art of itself, without any intention of teaching. Later, after he had return to teach officially, he felt impelled to RECEIVE promotion and recognitions, for a need to strengthen the hierarchical structure of his work and the good image in face the public opinion. Unlike certain teachers who had to literally buy or ask for their degrees (as it is know in the métier backstage), Master Dárcio never asked to receive any degree, but in the opposite, every time that it happened, he was called by his teachers to ACCEPT THE RECOGNITIONS. The Master Dárcio have degree in Veterinary Medicine (UECE) and has been retired since 1999 by the Agriculture Federal Station of Ceará. He is the founder of the Dárcio Lira School of Jiu-Jitsu - EDLJJ and FJJTEC (Traditional Jiu-Jitsu Federation of Ceará). He is an honored member of League Salteña Jiu-Jitsu (Argentina) and international delegate FIDAM (Federación Internacional de Artes Marciales) in the modality of Jiu-Jitsu. Additionally, he was one of more important activists of the country in the fight AGAINST the inclusion Martial Arts into the Physical Education curriculum (CONFEF Federal Council of Physical Education). He received many thanks for his dedication to this social movement to preserve of the differential cultural identity of Martial Arts. Thus, allowing the continuation of independence and autonomy of Martial Arts teaching in Brazil, without interference from the EDUCATION PHISYCAL CONCILS. In June 2010 he was honored at the Legislative Assembly of the State of Ceará for the relevant services rendered to the State, in the areas of humanitarian activities and sporting highlight, through the work of the Dárcio Lira School of JJ. Even though we have much documented evidence, we will never know for sure, all of the positive influence and impact that Master Dárcio Lira has contributed to the global community of Jiu-Jitsu. His dissemination of philosophical vision has became widely known and researched over the internet (much from the School’s official website.) The PIONEERING of the Master, in regard to the rescue of philosophical and ritualistic-disciplinary concepts of Eastern Martial Arts Culture, for the Jiu-Jitsu environment in Brazil is undeniable (and never seen before) and any sincere research can prove this. By the same internet, emails and more emails* have been received by the Master from renowned Teachers and sincere practitioners from various states of Brazil and elsewhere in the world, praising the differentiated Martial Teaching methodology of Master Dárcio Lira, thus reaffirming importance of his work. * Beside calls, conversations, letters and so forth. As those who recognize and publicly manifest, we are sure that thousands of others also in the distance, accompanying us even without manifest and have the DÁRCIO LIRA SCHOOL like a model to be followed (in view of the hundreds of hits to our website registered daily from various parts of Brazil and the world). However, regardless of any of the titles or above recognitions, the leadership of Master Francisco Dárcio Lira is unquestionable, it does not take more than a few minutes of conversation to realize his charisma, strength, eloquence along with his deep knowledge of martial philosophy. As the saying goes: "A Master is not made, it is recognized." I - MITSUYO MAEDA trained GRACIE CARLOS, who training GEORGE GRACIE who trained NILO VELOSO (in Bahia), who trained FRANCISCO SÁ (in Fortaleza), who graduated DÁRCIO LIRA (Fortaleza). II - TAKEO YANO (in Recife, Contracted by the Air Force) trained FRANCISCO SÁ, who graduated DARCIO LIRA. III - MITSUYO MAEDA trained GRACIE CARLOS, who trained GEORGE GRACIE, who trained NILO VELOSO, who trained JURANDIR MOURA, JOSE MARIA FREIRE and also BUILSON OSMAR they trained IVAN GOMES, who trained ZÉ GOMES, who graduated DÁRCIO LIRA (Fortaleza). IV - TAKEO YANO (Recife) trained JURANDIR MOURA, JOSE MARIA FREIRE and BUILSON OSMAR they trained IVAN GOMES, who trained ZÉ GOMES who graduated DÁRCIO LIRA. Note1: Mitsuyo Maeda and Takeo Yano arrived in Brazil from the Kodokan (World Judo Temple). Note2: Carlos Gracie was the brother of George, Hélio, Gastão (son) and Oswaldo. Note3: The full names of the direct Teachers Shihan Dárcio Lira are: Francisco Vieira e Sá (Sá) and José Simão da Cunha (Zé Gomes). 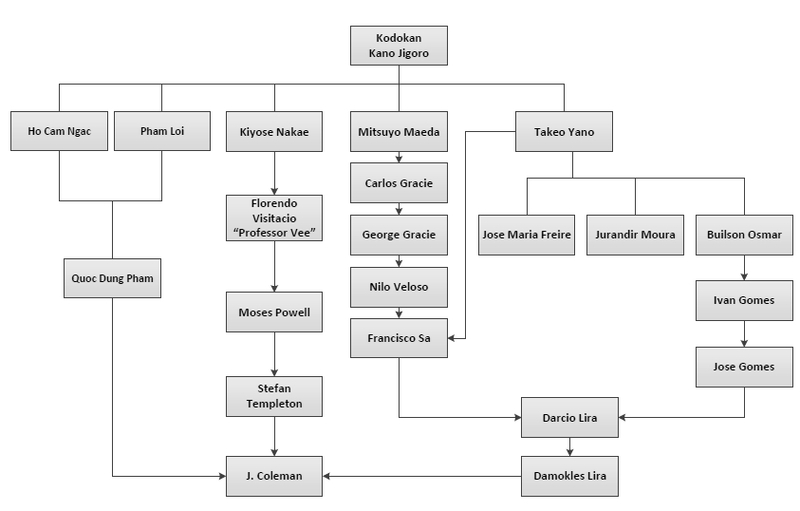 * This is the ONLY the genealogy of technical learning of our School; however, more importantly, it must be clear that a new Martial Lineage came from the Master Dárcio Lira, because of its innate spiritual sensitivity and his deep philosophical research, panning the transcendent legacy of the wise Monks-Warriors of the past, he It has developed a widely different teaching methodology of the model that he received from their teachers, which was intended only technical efficiency without any reminiscence of a deeper and ancient philosophy. Unlike them, the methodology developed by Master Dárcio Lira has sought to rescue this deeper philosophical essence of the ancient Monasteries of Martial Arts teaching of the East, where the objective of the training was the SPIRITUAL ILLUMINATION not just win over opponents.